What stay at home mom doesn't want to be a "homemaker"? I know I would love to have the perfect everything at home for my family. However…somewhere down the line I just got lost. I knew what I wanted, but didn't know how to get it. Well, after being invited to try the Homemaker's Mentor, I think I found it. This cd is filled with over 110 "lessons" for any age. 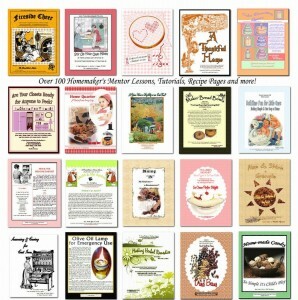 Martha Green and Rebekah Wilson spent four years putting all these wonderful files together for "normal" wanna-be homemakers like myself!These lessons are about everything!! They have some good recipes, and tricks to keep your house clean. Who wouldn't want a spa like bathroom or a mater bedroom retreat? Not to mention some really awesome stories that are really awesome to read aloud to the kids! I loved the tricks for the kitchen. And it is true…besides our living room, we spend most of our time in the kitchen, so why shouldn't it be nice and clean? We have the fun cabinets that sit low off the ceiling so you can "decorate" them with pretty little things. Well, the only problem with that is that dust loves to collect up there. Working your way around your kitchen is broken down into different lessons for you to make your kitchen a nice comfortable spot to hang out. Now, I just couldn't let you get interested in something like this and leave you hanging, could I? First, if you want your own copy of this wonderful cd, all you need to do is head over here and order one 🙂 They are selling for $37 with free shipping until the end of October. After that, the price will go up to $47. Want to win one? I have the chance to give away TWO of the cds (if you are outside of the US, you can get the zip files to download for your prize). Not only that, but there is a large giveaway going on until the 18th of October. You can win all the items pictured below by going right here. Very much interested in reading this when it comes out. Sounds like Mom and the Medicine Cabinet was a great choice for you and your kids. Thanks for reviewing! The step by step Spanish looks cool! I would love to be able to use this with my daughter. 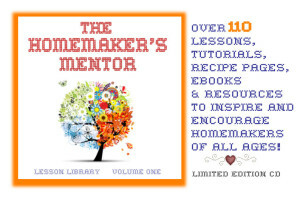 I would love to learn some homemaking tips! Especially because I think my kids would benefit from it. It sounds interesting! Thank you for sharing! 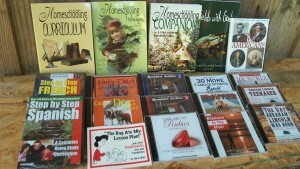 I found your post on Blogging Homeschoolers Daily Post Share. I need help with meal planning. I am interested in the spa-like bathroom. i would love the cooking lessons to teach my girls. they love to be in the kitchen. but then again all of the lessons on th cd seem fabulous and so I am sure we would value them all. I love all the options. The spice unit studies looked pretty cool and I would love to figure out how to make lovely candies. Plus, my closets need tamed. Again. So many things there. Thank you. I would love to learn to be a homemaker. I am far from it and but I have dreams of it! I’m looking forward to everything. I will use it for myself as well as my 3 daughters.